Mahmud Shah, surnamed Abdus Salam or Salam Shah, whose exact date of birth is not known. But the evidence is in favour of his having been born in 859/1456 in Shahr-i Babak, where he mostly passed early life. He is also called Shah Salamullah. He ascended to the office of Imamate at the age of 21 years. It is related that he was a pragmatic scholar and had gleaned historical informations from his father and the elders of the community, notably the period streching from the reduction of Alamut to his time. Nothing is however known whether he compiled any work in this context. It seems that Imam Mustansir billah II and his successor, Abdus Salam had strictly advised the Ismailis in Iran, Central Asia and India not to refer or divulge the name of the Imam of the time in presence of the ignorants, and adopt taqiya. For instance, it is written in "Pandiyat-i Jawanmardi" (p. 56) that: "O, truly-faithful believers, Mawlana Shah Mustansir bi'l-lah says: do not mention myself and the name of your Imam, Shah Abdu's-Salam Shah, in the presence of the ignorant and unbelieving people who have an innate hatred of the Prophetship and Imamate. You must, however, appeal to him in your heart and with your tongues. Conceal my whereabouts (sirr'i ma'ra) from the irreligious people of today (ghayr din'i zamana), so that you may for this attain the perfect reward and a righteous life. God the Bountiful will be pleased by you, the people of sincere faith, and your hearts will be enlightened, shinning, and full of joy." W. Ivanow comments on "Pandiyat-i Jawanmardi" that, "The book, or its greater part, was compiled under Shah Abdu's-Salam who succeeded Imam Mustansir bi'l-lah and thus really was the Imam of the time when the compiler was engaged in writing. The enigmatic passage on p. 56 may be easily explained if we suggest that Mustansir bi'l-lah told his followers not to disclose his own identity to outsiders, nor of the Imam of one's time generally. And as the Imam of the time at the moment when the compiler was writing was Shah Abdu's-Salam, he automatically mentioned his name." The Ismailis used to visit Kahek, where they were lodged and such facility was also created in Shahr-i Babak. It is said that the Indian Ismailis were granted the titles of Varas and Rai. Some Sufi sounding khanqahs (cloisters) had been also built in Shahr-i Babak. The Indian and Syrian pilgrims were lodged in different taverns, where they were looked after by some Ismaili guards, who also escorted them during their departure. Some escorts also joined the pilgrims to track them over the safe route. In Iran, the descendants of Taymur have founded their own petty rules. The Ottoman empire in Turkey became powerful, and sultan Suleman, the Magnificent had captured Istanbul in 1453, making a door open into Europe. 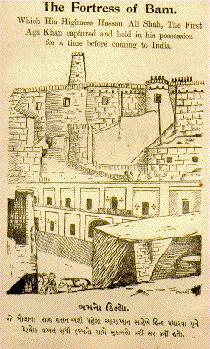 The Mamluk kingdom in Egypt was impaired due to internal wars. The Christianity continued to be dominated by the tradition of Popes in Europe. It must be noted on this juncture that the first Pope to claim superiority over the European Christendom was Innocent I (402-417). The temporal power of the papacy was not, however, established until the 8th century, when Pepin le Bref and Charlemagne conferred estates on the Pope. Charlemagne was crowned by Leo III in 800 A.D., this being the first act indicative of the Pope's temporal power. Under Innocent III (1198-1216) and his immediate successors, the papacy reached the summit of its greatness. The right of papal election first however vested in the cardinals in 1059. The Crusades or al-hurub al-salibiyya (wars of the cross) between the Muslims and Christians had began in 488/1095 and lasted for about two centuries, in which eight major battles were fought till 690/1291. During these periods, the Islamic philosophy, physics, chemistry and other arts and science had greatly influenced the Christians in Europe. Many notable works of the Muslim philosophers and scientists had been translated into European languages. The works of Ibn Sina and others were taught in the leading western universities. The new research was made upon the theories and experiments suggested by the Muslim scientists. R. Briffault writes in "The Making of Humanity" (London, 1928, p. 191) that, "What we call science arose in Europe as a result of a new spirit of inquiry, of new methods of investigation, of the methods of experiment, observation, and measurement, of the development of mathematics in a form unknown to the Greeks. That spirit and those methods were introduced into the European world by the Arabs." The Europe entered thereupon into a new epoch, resulting ultimately to the age of Renaissance. So long as the Muslims were in the vanguard of knowledge, they led the civilized world in culture, science and philosophy. But as soon as they lost interest in independent inquiry, they ceased to exist as a dynamic force. Science was discredited by the orthodox minds on the plea that it led to materialism, and philosophy was opposed as intellect debarred from entering the portals of divine knowledge. The reasonbecame the target of attack and even an object of ridicule. Science and philosophy were absolutely condemned. What remained was a fairy tale, very comforting stuff to the ignoramus but extremely injurious to the nation as a whole. The Muslim countries thus witnessed a terrible decline not only in their intellectual and cultural life, but also in their political status soon after the awakening of Europe from a long slumber - an awakening which was the result of western intellectual, scientific and philosophical movements - a way paving to the Renaissance in Europe. The Muslim powers were at the lowest ebb due to mutual wars - a force which worked negatively for them. The Ottomans of Turkey, the Safavids of Iran and the Mughals of India however had increased their influences, but could not be helpful to save the decline of the Islamic thought and culture. It has been heretofore referred that the tradition of the pir for the Indian community had been suspended in the time of Imam Mustansir billah after the death of Pir Tajuddin in 873/1467. The Indian tradition relates that a certain Nizamuddin Kapur, known as Kamadia Kapur or Kapura Lohana, whose tomb is near the Bhambari village, about eleven miles from Tando Muhammad Khan; had visited Iran with an Indian deputation, and humbly urged Abdus Salam to send next hujjat, or pir in India. He insisted that the whole Indian community should not be punished for the misconduct of one jamat of Sind. Abdus Salam is reported to have said: "I cannot revoke the decision of my father." Kamadia Kapur and his team lodged in Shahr-i Babak for some months and craved devotionally to win the heart of the Imam. One day, Imam summoned him at his residence and said: "My father has suspended the tradition of pir for India, which will not be revoked in my period. I, however, appoint a samit (silent) pir instead." The Imam thus gave him a book, namely "Pandiyat-i Jawanmardi" with an instruction to obey its advices as if a natiq (speaking) pir. The tradition further relates that the Imam had taken a word from Kamadia Kapur that the name of the jamat, who misbehaved with Pir Tajuddin in Sind, would not be divulged in other Ismaili jamats, so as to retain the unity of the Indian communities. "Pandiyat-i Jawanmardi" (maxims of fortitude) is a collection of the advices of Imam Mustansir billah, which had been compiled in the time of Abdus Salam when Kamadia Kapur was in Shahr-i Babak. The word pandiyat is the plural of pand means "advice", and jawanmardi means "manliness". In other words, it contains the advices (pandiyat) for the true believers (mumins) and to those seeking to attain the exemplary standards of manliness (jawandmardi). It is factorized into three sections, viz. Pandiyat great, Pandiyat small and twelve Jawanmardi, also contains few farmans of Abdus Salam. It deals with the advices to the believers on ethics, humanity, behavior, etc. The Ismailis are referred to by the Sufic sounding terms as ahl-i haqq and ahl-i haqiqat (the people of the truth), while the Imam himself is termed as pir, murshid and qutb. It is venerated as if an authorized pir or hujjat in India, and is being read in Yarkand, Gilgit, Hunza, Chitral, Badakhshan, and Iran. Abdus Salam also wrote "Panj Sukhan-i Hazarat-i Shah Abdus Salam", the instructive advices for the believers in 30 pages. It is another small collection of the advices followed most probably by the compilation of "Pandiyat-i Jawanmardi", otherwise it would have been most possibly incorporated in it. means, "I am Abdus Salam at present, but not happy with the people of assembly. I will depart from this assembly, and will appear next time in another dress." It is known that a group of Momin-Shahis adhered Raziuddin, the father of Shah Tahir Hussain Dakkani (d. 956/1549) as their Imam in Badakhshan. Abdus Salam sent his three farmans, instructing the erring group to revert to the fold of the legitimate line. These farmans, found in a "Maj'mua" in Kirman, bearing the signature of the Imam with a date of 895/1490. Sayed Suhrab Wali Badakhshani flourished in this period. He was hailed from Herat and passed his life in Badakhshan and Kabul as a local missionary. In his writing, he writes the date 856/1452 which suggests that he lived in the time of Imam Muhammad bin Islam Shah (d. 868/1463), Imam Mustansir billah (d. 880/1475) and Imam Abdus Salam (d. 899/1493). It appears from his "Nur-nama" that he was most possibbly influenced with the teachings of the dais of Pir Shams in Badakhshan to some extent. He however, continued to preach the teachings of Nasir Khusaro. He was followed by Sayed Umar Yamghani, whose descendants and followers continued Ismaili mission around Badakhshan, and propagated as far as Hunza, Gilgit, Chitral and Ghazar. On hearing this, Abul Muzaffar Yaqub Khan (883-896/1478-1490), the son of Uzun Hasan sent against the aggressors a numerous army under the command of Sufi Khalil Beg. They were reinforced by Baysunqur Beg. The Chaghatays and Turkomans sent their families and baggages into the stronghold of Sirjan, while they themselves took their stand in Kirman, determining to put up a strong fight. The forces of Sufi Khalil Beg first went to the stronghold of Sirjan and captured it in the first inroad, and their enemies fled to Jurjan and Tabaristan. Having razed to the ground the strongholds of Sirjan and Kirman, the Ak-Koyunlu commander returned to Azerbaijan. We do not have any detail of the Imam and the Ismailis in the contemporary sources, but it ensues from sparsely traditions that Imam Abdus Salam had most possibly evacuated Shahr-i Babak in early period of 883/1478 with the Ismailis before the roaring march of the Chaghatays and Turkomans, and after their suppression, he returned to Shahr-i Babak. Gah piru gah tiflu gah burna mishawad. Gah dar miraj rafta gah andar chah shud. Gar ba-sad surat bar ayad mardi manira chi gham. Gah Mustansir shudu gahi Salamullah shud. "Sometimes he (appears as) an old man, or a child, or a youth. Sometimes he goes in a miraj, sometimes he goes into an abyss. Why should the knowing one worry about, even if he comes up in a hundred forms. Sometimes as Mustansir, and sometimes as Salamullah." Imam Abdus Salam died in 899/1493 in Shahr-i Babak, and with his death the Imamate devolved upon his son, Gharib Mirza. It has been a source of utter surprise that the European knowledge of the Syrian Ismailis had not progressed much beyond what the Crusaders and their chroniclers had transmitted, and the field continued to be dominated by the old myth, fanciful impressions and fictitious narratives. For instance, Felix Fabri, who visited Jerusalem twice in 1480 and 1484, mentions the Ismailis among the peoples of the region in the same vein. In his "The Book of the Wanderings of Brother Felix Fabri" (tr. by Stewart, London, 1987, 2nd vol., p. 390), he writes for the Ismailis that they "are exceedingly obedient to their own captain (the local chief), for they believe that it is by obedience alone that they can win happiness hereafter. Their captain causes their young men to be taught diverse languages, and sends them out into other kingdoms to serve the kings thereof, to the end that, when the time requires it, each king's servant may kill him by poison or otherwise. If after slaying a king the servant makes good his escape to his own land, he is rewarded with honours, riches and dignities; if he is taken and put to death, he is worshipped in his own country as a martyre." This is an ample instance to understand how the enemies of the Ismailis bring and then adjust the old myths down to their own period as if a contemporary account.